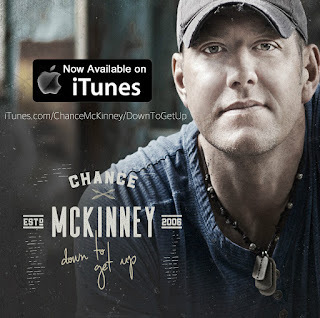 Chance McKinney's NEW CD #DownToGetUp hit iTunes and Amazon last night at midnight... and WOW, what a response it got. The independent singer/songwriter who won CMT's Music City Madness and has been on tour with Blake Shelton, Luke Bryan, Dierks Bentley, Lynyrd Skynyrd and many more had a fan base that launched #DownToGetUp into the Top 50 on iTunes Country Album Chart almost immediately. "I'm flattered, shocked and determined all at once" says McKinney. "I knew we'd be flirting with some pretty high numbers after sitting for 3 weeks on the PRE-ORDER chart somewhere between #12 and #36, but to debut in the Top 50 on the world-wide country charts... that was a little unexpected." Get #DownToGetUp now and watch the kid from Montana keep climbing! #DownToGetUp Now available for PRE-ORDER... and it's rolling! Chance McKinney's DOWN TO GET UP hit iTunes yesterday (8/8/16) in a PRE-SALE set for release on Sept 5th, 2016. On day one, we managed to hit #15 on the PRE-ORDERS chart right behind the likes of Florida Georgia Line, Jason Aldean, Justin Moore, Dolly Parton and Willie Nelson. Today (8/9/16), as of right now, we've surpassed Willie Nelson and now sit at #12 on the PRE-ORDERS chart for iTunes country music! Grab your's now at http://www.iTunes.com/ChanceMcKinney/DownToGetUp and help push CMT's Music City Madness Winner into the Top 10 on iTunes! "It's the greatest (work) achievement I've ever attempted" says Chance and "I hope it shows those who have supported me how much I appreciate all their help. #DownToGetUp is the CD I've always wanted to make. It's just been a process to get to this level." It's not often we're called upon to help neighbors in such dire need, but when the opportunity arises, nobody can say the Pacific Northwest isn't up for the challenge! Chance McKinney & Tulalip Resort Casino are proud to announce the OSO LANDSLIDE VICTIMS BENEFIT this Friday Night, April 4th at 9pm! Goal: Donate $10,000 to the victims by night's end. Result: A great night... With great people... for a great cause. If you want more constant contact, please join Chance on Facebook at (http://www.facebook.com/ChanceMcKinneyMusic) or Twitter at (http://www.twitter.com/ChanceMcKinney) and don't forget to grab Chance's latest CD "Think About That" on iTunes at (https://itunes.apple.com/us/album/think-about-that/id641836235). We're proud to say that "Math Teacher who won the CMT contest" debuted at #62 on the iTunes Country ALBUM Charts with this latest release.